A strong economy and high consumer confidence fueled strong travel performance in 2018. Phocuswright's recent travel research identifies four key developments that make the U.S. online travel agency (OTA) market an exciting one to watch in 2019. 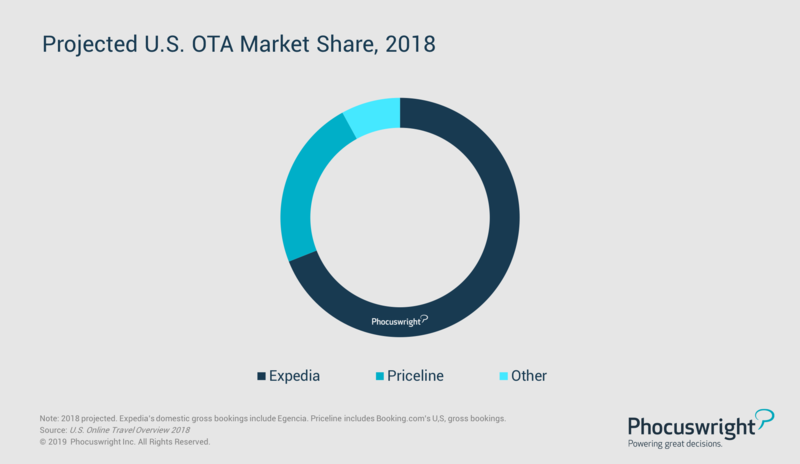 Expedia and Booking continue to dominate in the U.S., with the two collectively representing 92% of the OTA market. They both made deeper inroads into segments outside flight and hotel, secured more global investments and continued exploring emerging tech, demonstrating there is still plenty of opportunity for the duopoly to grow its footprint even further. Attend Phocuswright Europe to hear from Booking.com, Expedia and more to explore the shifting landscape for OTAs and intermediaries in Europe and beyond. Asia Pacific (APAC) remains a coveted market where U.S.-based hopefuls continue to aggressively seek inroads to expand both their product offerings and customer base. For Booking, a $500 million investment in DiDi and a $200 million in Grab, allows users of its app to hail cars offered by Didi and Grab, whose users can likewise book hotel inventory supplied by Booking.com or Agoda. Expedia bought out the remaining 25% share of AAE Travel and invested $350 million in SE OTA Traveloka. These ventures extend mutually beneficial offerings and give Expedia another main APAC alliance in Traveloka. Online travel's biggest intermediaries tag the segment as the next big source for growth, with the activities market still ripe for digital expansion. For OTAs, it's a largely untapped segment with ample opportunity to add to revenues; 80% of gross bookings still remain offline. It's one of the last remaining sectors to be added to OTAs' product offerings as they race to build the most comprehensive one-stop travel shops. General voice tech usage is gaining popularity among U.S. consumers, and OTAs are testing, learning and gradually incorporating new voice features to connect with customers wherever they are. The share of U.S. online travelers who feel comfortable researching travel through voice is nearing 50%, but interest in voice booking lags. Only one in three U.S. online travelers are currently comfortable with the idea of booking travel products like flight or hotel through voice.